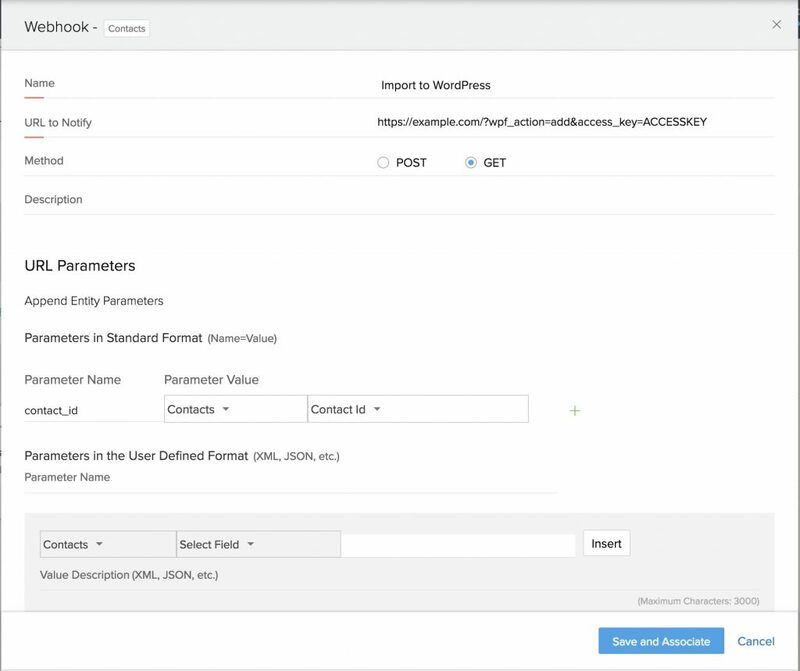 You can use webhooks in Zoho to send data back to your WordPress site using WP Fusion. 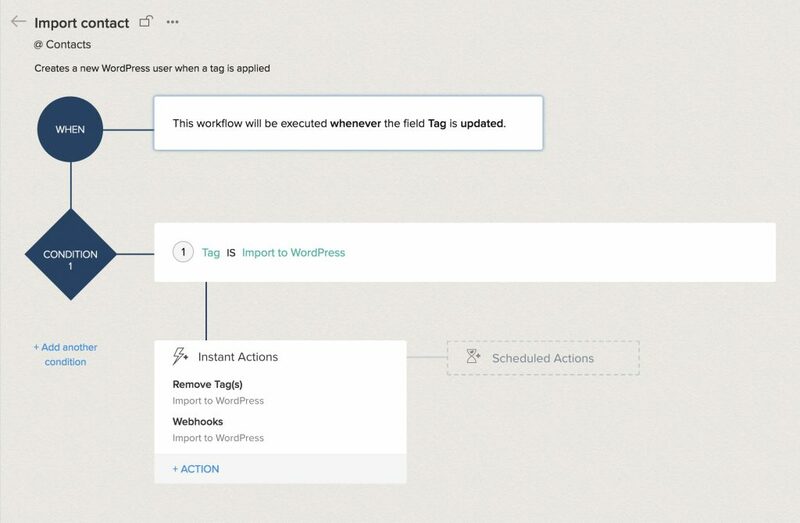 Using webhooks you can create new users on your WordPress site based on workflow rules in Zoho, or update existing users’ meta data and tags. Webhooks are managed in Zoho under Setup >> Workflow Rules. If you’re already logged into your Zoho account, you should be able to access this page by following this link. For this tutorial, we’ll be showing you how to create a new WordPress user when a specific tag is applied to a Zoho contact. See below for additional options when constructing the URL parameters. The module should be Contacts. You can specify a rule name and description to help organize your Workflow Rules. The first step, When, specifies when the Workflow Rule should apply. 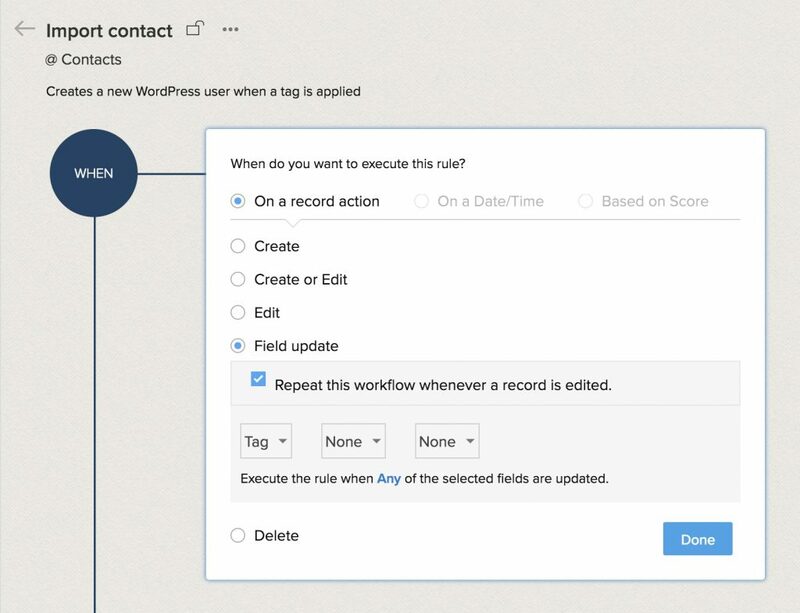 Select “On a record action”, and choose “Field update” as in the screenshot above. For the field to be used as the trigger, select “Tag”, and then press Done to move on to the next step. Create a condition, so that the rule is only processed when the desired tag is applied. In this case we’re using the tag Import to WordPress. Then click Next. The URL to Notify should be the URL to your WordPress site, followed by ?wpf_action=add and &access_key=ACCESSKEY, where ACCESSKEY is the access key provided at the bottom of the General Settings tab in the WP Fusion settings on your site. Then, under URL Parameters add a parameter for contact_id, and select Contacts and Contact Id from the dropdowns to the right. This will send the contact ID of the contact to be imported. Then click Save and Associate to continue. After setting everything up, your Workflow Rule should look like the screenshot above. Go ahead and save the Workflow Rule. 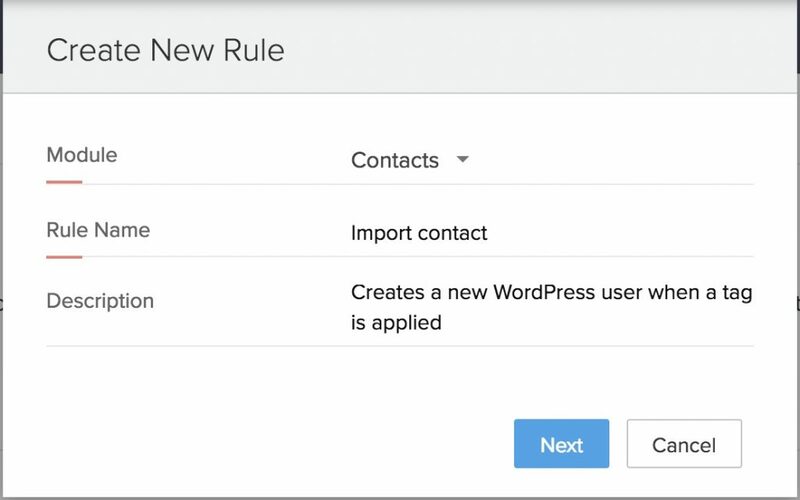 Now, every time the tag Import to WordPress is applied to a contact, a new WordPress user will be created based on their contact data in Zoho. If the user already exists on the site, they will be updated (no duplicate users will be created). Note: By default, user accounts will be created with their email address as the username and a randomly generated password. However, if you have created a custom username field and password field in your Zoho application, and enabled these fields in WP Fusion for sync with user_login and user_pass on your website, the new users will be given the usernames and passwords stored in their Zoho contact record. New user accounts will be created with an automatically generated password. If you’d like to use this password in your email marketing, you can send the password back to Zoho after it has been generated. In the Webhooks section of the General settings tab, check the box for Return Password, and select a field in Zoho where the password should be stored.